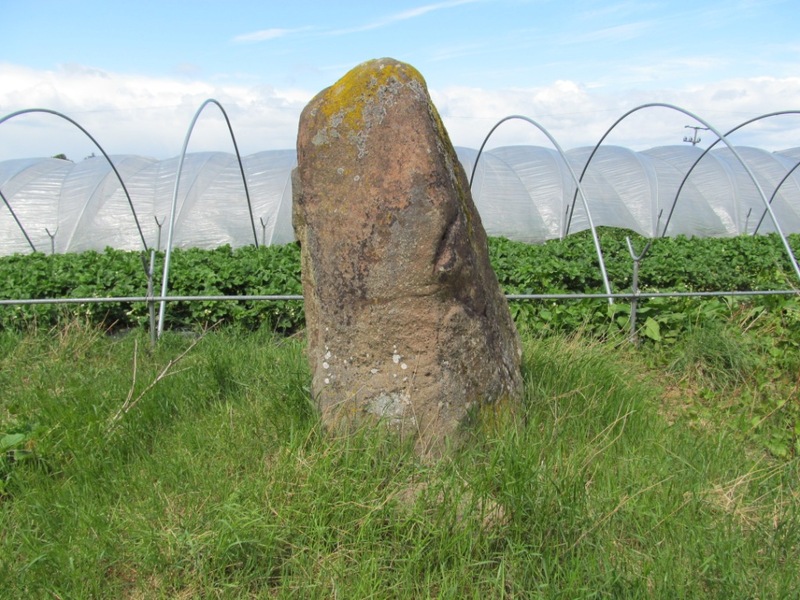 Amidst the gelatinous polytunnels stood a standing stone looking rather sad and lonely in a strawberry field. But the strawberries have gone now, and the stone is revealed. 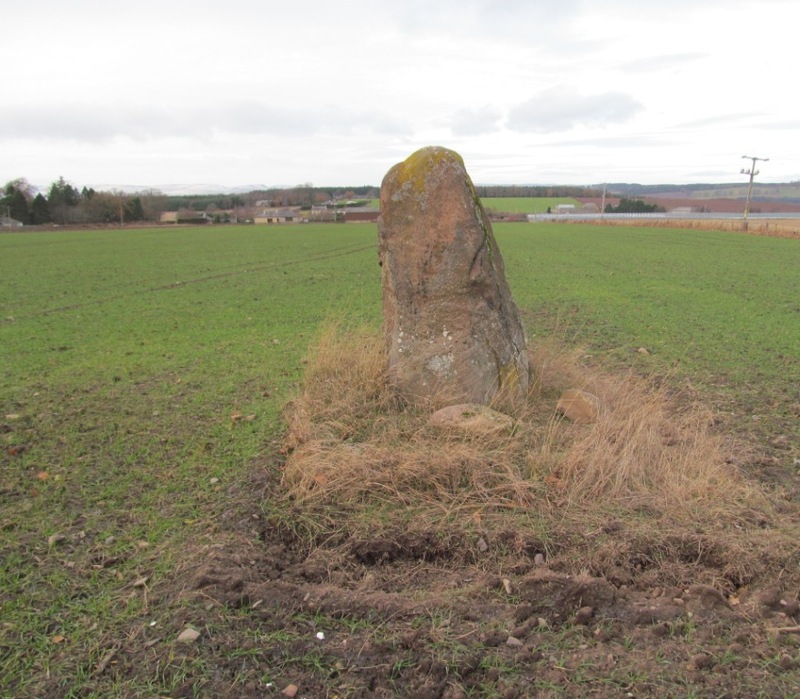 This single standing stone can be found in a field on the north edge of the village of Dunning near Perth. Almost nothing is known about this stone, which has National Monuments Record of Scotland number NO01SW 9. The only information that Ordnance Survey fieldworkers deemed fit to record when they visited the stone in November 1965 were the basic physical parameters, ‘1.9m high by 0.8m by 1.0m’. Yet this is spurious and meaningless information, metric facts that shed no light on when or why the standing stone was erected. 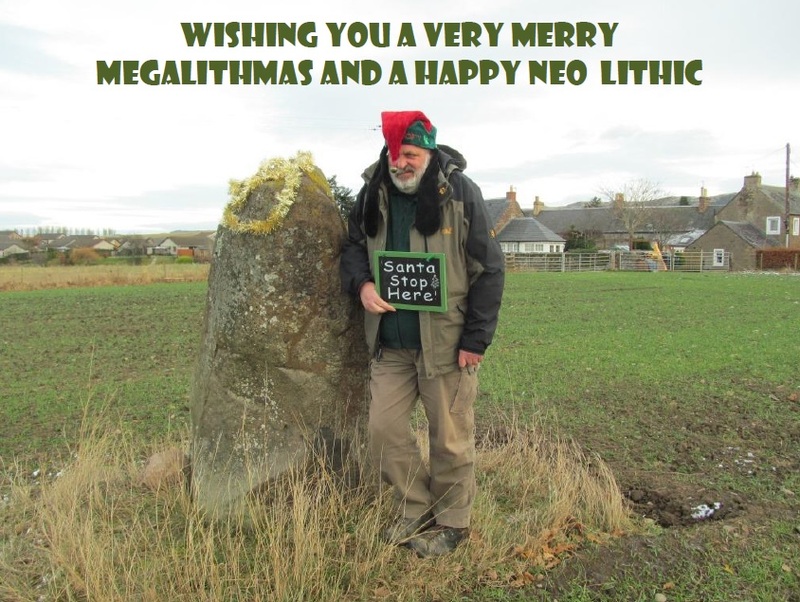 The stone is a Scheduled Ancient Monument, so Historic Scotland thinks that this is a nationally important monument, although I would imagine they don’t really know why it should have this status other than following the habit of designating all megaliths in this way. 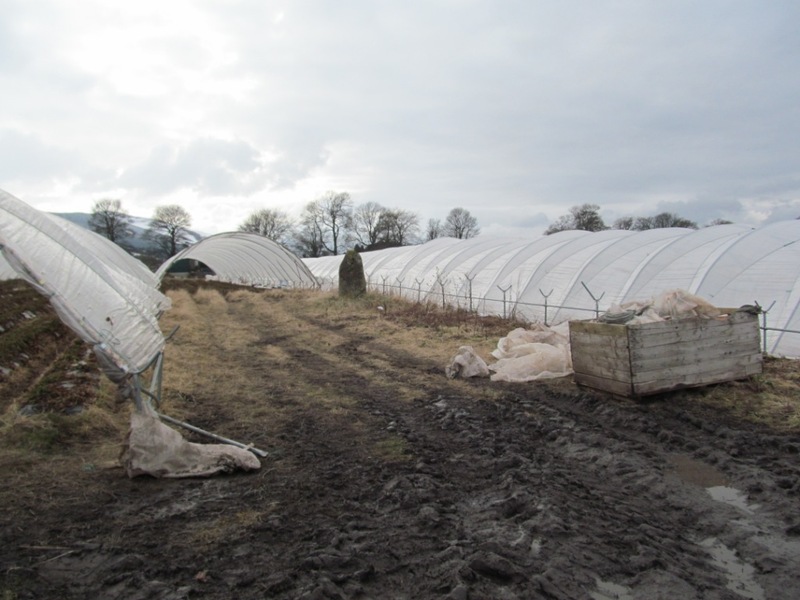 Given this elevated status, the stone has been treated pretty shabbily in recent year, shrouded in a veil of sturdy plastic coated polytunnels, to facilitate efficient and bounteous strawberry growing. I visited the stone three times earlier this year (March, May, June) and found it to be in an almost entirely enclosed location, with polytunnels on three sides, and some pallets, bent steel tubing and other crap flanking its eastern side. The stone looks cracked, the result of weathering.It sits on a low mound, not mentioned in any report, although this could simply be a product of modern farming activity; certainly some big rocks from the surrounding field have gathered around the base of the stone. When this field is ploughed, machines run close to the stone, leaving it sitting on a small stony grassy square island. Some scrapes on the stone may have been caused by a passing tractor or harvester. I have also been told by someone who lives locally that the stone may have been moved at some point, although I cannot find any record of this. 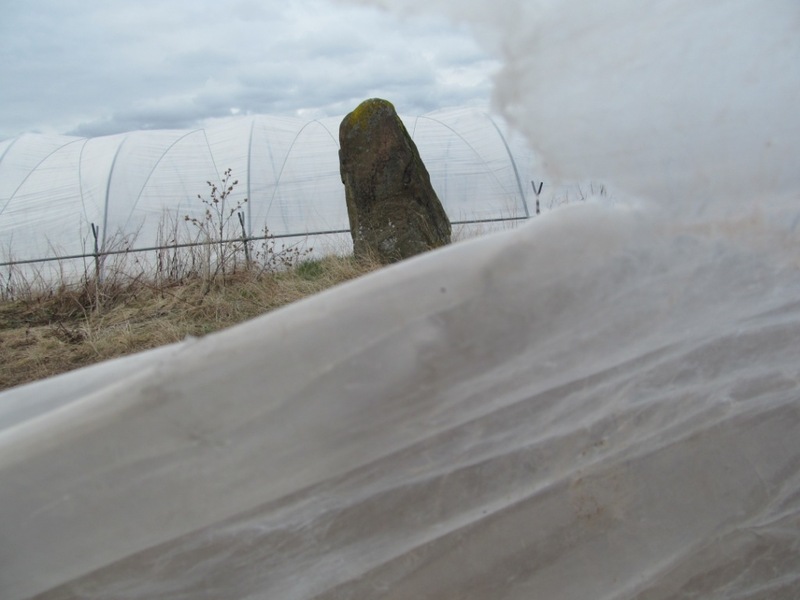 The stone has a rather ghostly appearance, especially when viewed from amidst the strawberries, through rips and tears in the grey plastic, billowing in the wind like curtains in a haunted house. In the absence of archaeological engagement with this standing stone, a history has become attached to it, albeit it is unlikely to be true. 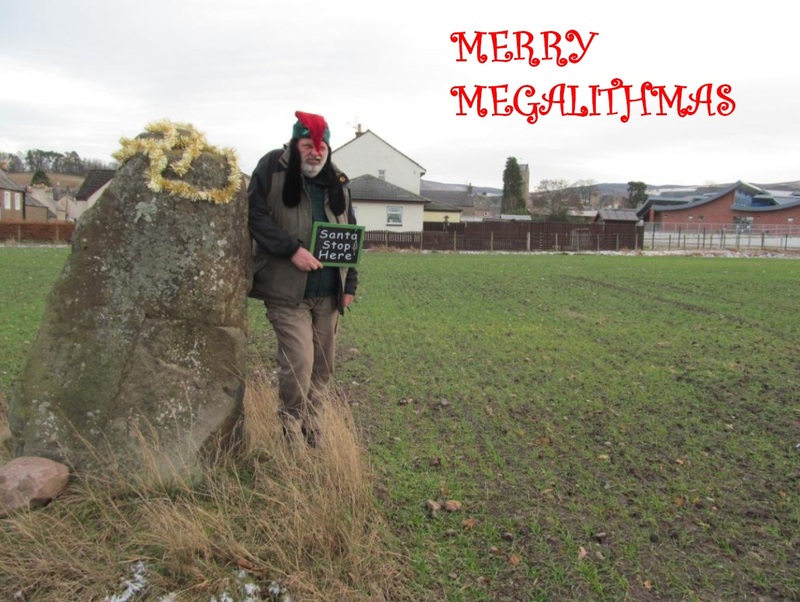 In some quarters the megalith seems to be known as Doncha’s Stone, because it is said to mark either the literal burial place, or act as a monument to, Doncha, the Abbot of Dunkeld, who died in the area during the Battle of Duncrub in AD 964. This battle, which has a flavour of both myth and legend was apparently a power struggle between the Duff / Dub and Colin / Culen / Cuilen. Sadly Colin lost and the Abbot died. The battle or skirmish is said to have taken place on the Dorsum Crup (‘ridge of the crub’) which is taken to be Duncrub (on the edge of Dunning), although the field within which the stone stands is certainly not a ridge. There is a good deal of confusion about people and places here, and it seems the standing stone has become entangled in these myths. But at least it has a story, a name, to cling on to. 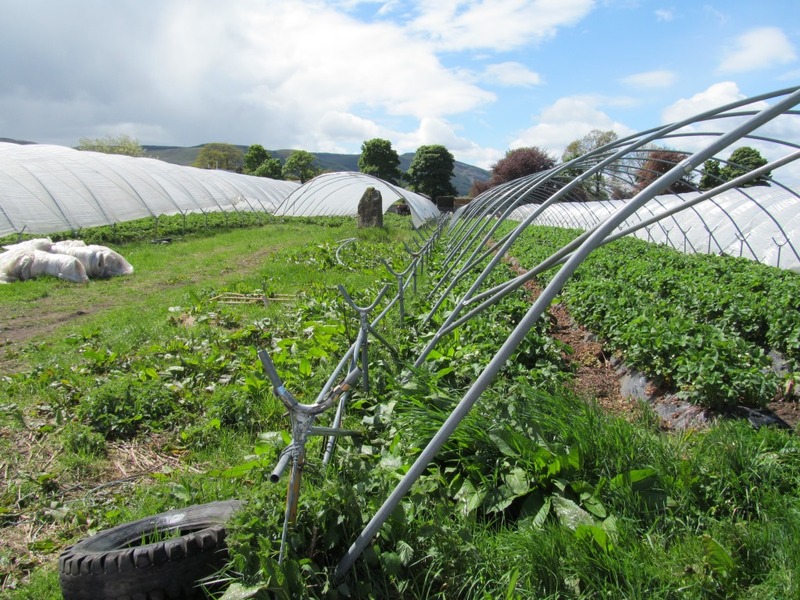 I visited the stone once again this week, because I knew that earlier in the autumn the strawberries and the polytunnels had been removed completely from this field, and from the fields to the north around Leadketty and Corrigall. 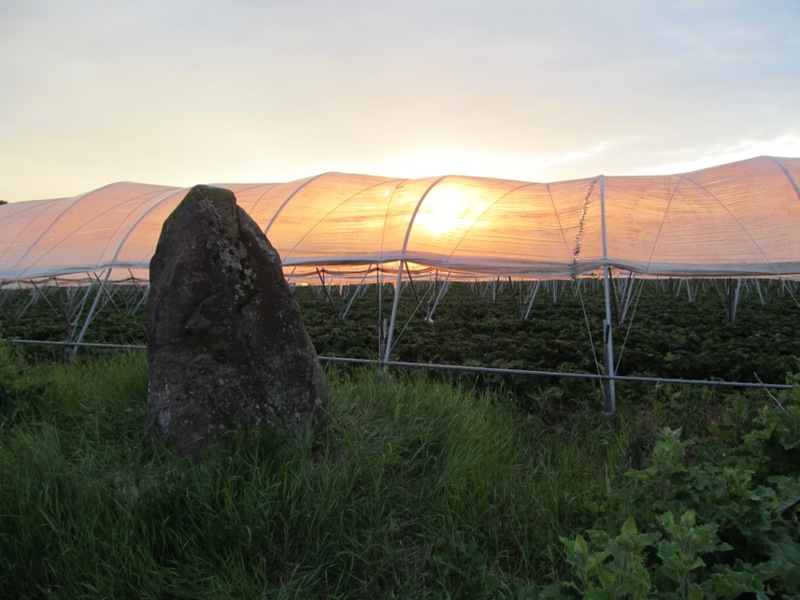 The farming of strawberries and the structures associated with it – massive steel-tubed tunnels covered in polythene and a line of big timber posts and fencing screening the polytunnels from the B9141 road – has been here for so long that I had forgotten what the stone looked like when free of these modern industrial-scale encumbrances. What was once a stone that was hidden from sight is now a free-standing megalith, out in the open for all to see, from the village and the road. And this democratising of the stone has had another effect. It opens up a range of views from the stone as well as towards it. Depending on your perspective, standing at the stone can provide views of houses to the south, or spectacular mountains to the north. The monument may have an urban aspect, but is also hints at other connections that may have been made in prehistory, to the magic mountains and high peaks on the distant horizon. 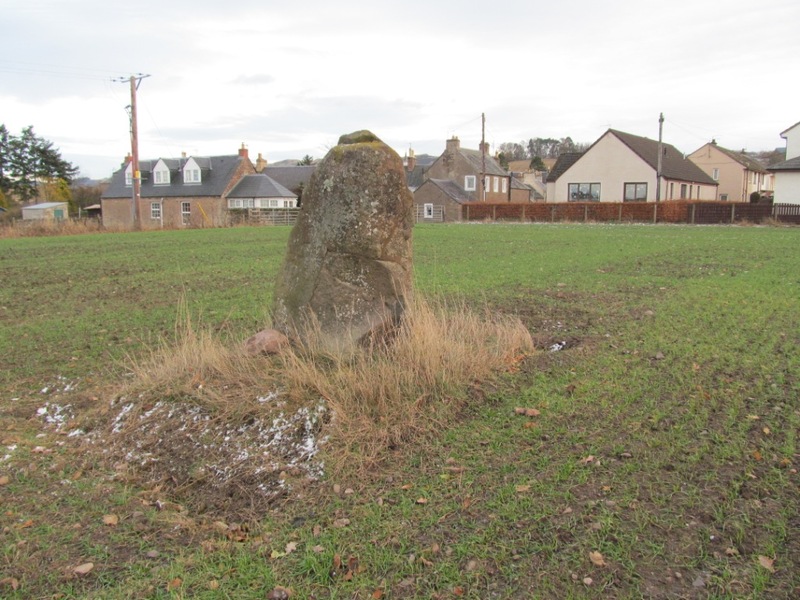 The stone has been liberated from its polythene cocoon, and has blossomed into a standing stone that the people of Dunning can enjoy again. 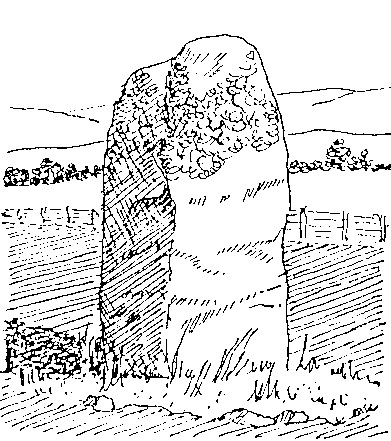 Sources: The drawing of the standing stone is by Kenny Laing, and was originally published in Angus Watson’s 1995 book The Ochils. Placenames, History, Tradition. The image as it has been reproduced in this post was sourced from the excellent website of the Dunning Parish Historical Society. 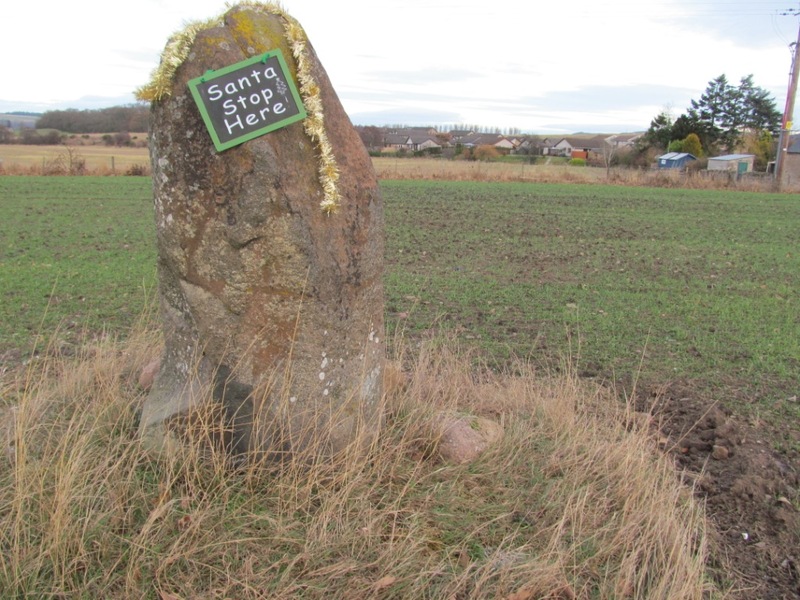 This is a wonderful source of information on all things Dunning (including some of the background on the standing stone outlined above) and I recommend a visit to the website, and the village. Thanks to those who have visited the stone with me: Dene, Fiona and Helen.